The most recent Team Fortress 2 update brings with it updates that may radically change the way we play the game, including the fascinating—but still unannounced—addition of headgear to classes. Oh, it gets much better. While the official Valve change log rather mundanely notes that the Team Fortress 2 team has "reworked the character loadout screens to support future features," it doesn't specify what the pictured "head" slot is for. Fortunately, some of the game's data files may give us a very clear picture about what we'll see on each class' noggins. 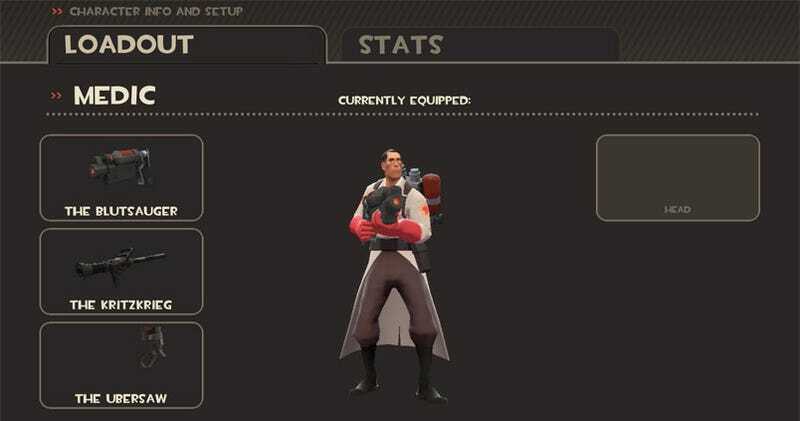 They may also lay out the future of TF2 class changes. Each class appears to be receiving new headgear, which may or may not have an impact on gameplay. The Heavy looks like he's getting a football helmet, with the Demoman getting a 'Fro, as they call it. The Engineer's getting a mining helmet, and the Scout's getting a batter's helmet. The most intriguing, though, is the Sniper's "tooth belt." The same documents also list other loadout slots beyond primary, secondary and melee weapons, including an open slot for grenades, PDAs and buildings. While that could mean that grenades could be returning to Team Fortress, those slots could be Demoman and Engineer class specific slots. But the biggest potential game changer includes what appear to be Diablo II-like item attributes that modify the way weapons behave. These include variations on things like clip size, firing speed, critical hits, chance to slow targets on hit, Ubercharge rate and much more. Game files even describe these as having levels, naming weapons in the style of "Level 4 Medigun of X ÜberCharge rate." If these randomized weapons drop from downed enemies, it could make the game very interesting. The addition of all these potential loadout items may explain why Valve just added an option to permanently delete an unlocked weapon (or item) from one's inventory in the latest update. The developer may be limiting the number of weapons and items a player can carry in his "backpack." We'll also note that these may be work-in-progress updates, things that may change over time or may never see the light of day. We've contacted Valve to see if the company can explain these changes further. Thanks to BlankDiploma and Kevin S. for the heads up!